Héritage Ladies & Gents: An elegant celebration of love! On the eve of its 80th birthday, the creator of mechanical watches Louis Erard is clearly on top form! Its dynamism, its passion, as well as its lasting success that is the secret of eternal youth have led it to design a whole new generation of the Héritage collection which continues to wind its undisturbed path through time. The slender and particularly feminine Ladies version now accompanies the Gents version to form a pair of elegant timepieces intended for lovers of fine watchmaking – and indeed simply for lovers! 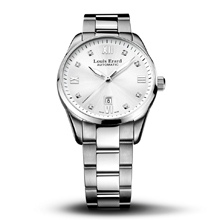 Louis Erard remains loyal to the values on which it has built its reputation. The spirit of fine watchmaking at reasonable prices: such is its enduring creed and mission. Elegant design, high-quality materials, meticulous finishing and reliable mechanisms dedicated to ensuring high precision are all offered at particularly attractive prices. This is a watchmaker that deliberately steers clear of excess, overrating and extravagance, preferring to achieve excellence with honesty and combine it with affordability. Witness the new faces in the Héritage line: featuring a blend of luxury and restrained understatement, these timepieces are within reach of men and women looking for that little air of refinement without sky-high prices. Far from merely counting off the inexorably fleeting flow of time, the Ladies and Gents Héritage collections compose poetry that creates an atmosphere of beauty around the seconds, minutes and hours represented by the hands dancing merrily around the dial. 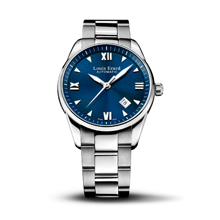 Graceful Roman numerals adorn the black, anthracite, blue or white dial, as well as the mother-of-pearl version with its gently shimmering effects. 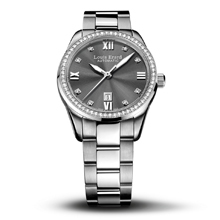 A dainty date display appears above the VI on the Ladies model, while the Gents version features an original diversion with an aperture slightly off-set between 4 and 5 o’clock. For the first time, Louis Erard is focusing exclusively on steel for both case and bracelet, guaranteeing peerless robustness, durability and flexibility. The contrast between brushed and brilliant-polished surfaces lends a fresh touch and endows the overall composition with considerable strength of character. While the emphasis is placed on understated authenticity, Louis Erard’s love of high-precision mechanisms is revealed through an opening in the case-back that provides a fascinating glimpse of the movement’s intricate inner workings. What an amazing finesse! What meticulous details! What a sophisticated complexity! What a beauty! The vision of the heart of this horological gem instils a natural sense of wonderment when contemplating the precious value of each passing moment. As if to play on contrasts, Louis Erard juxtaposes this ode to the moment with the eternity of diamonds, which adorn the gem-set versions of this collection. The sparkling hour-markers are surrounded by a bezel that may also be gem-set, enabling both Ladies and Gents Héritage watches to shine in the light of the most glowing brilliants. This newly united pair of timepieces comes in a variety of interpretations: the dial colour, the size of the case (30mm or 40mm), the presence and the position of the diamonds can all be specifically chosen by those who fall in love with these watches, and who are simply invited to say “yes” to all their wishes!